A while back, I went to a local estate sale where I found two fountain pens. 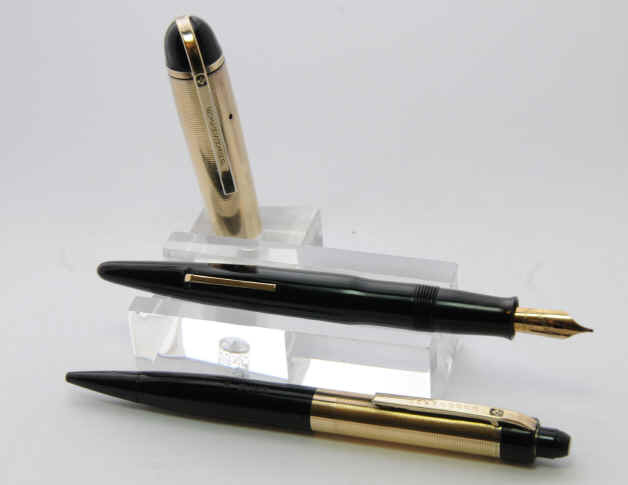 One was a lovely little Sheaffer BCHR ringtop and the other was one I had never seen before. It turned out to be an Army Brown Eversharp Skyline. 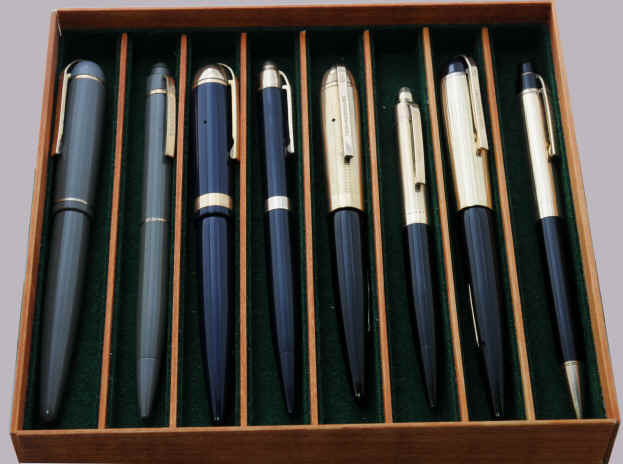 That pen stirred my interest and I found that Skylines were not only the most popular pen of the 1940s, but that there was an incredible variety of models, ranging from solid color all plastic to solid gold. 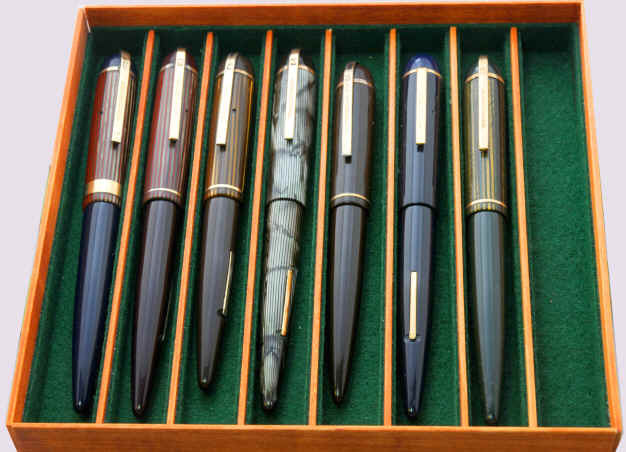 This variety, combined with the large number made, combine to make these pens available and affordable. Since then, I have collected a number of Skylines, and lately have begun to try to match pens and pencils into sets. Below are most of my Skyline collection. The standard size is 5 1/4" capped and demi is 4 7/8". This tray contains pen/pencil pairs. Standard size pen, solid color, no cap band, short clip, "Streamliner"
Standard size pen, solid color plastic, no cap band, short clip. On the right is a pen/pencil set that has become my daily writer. 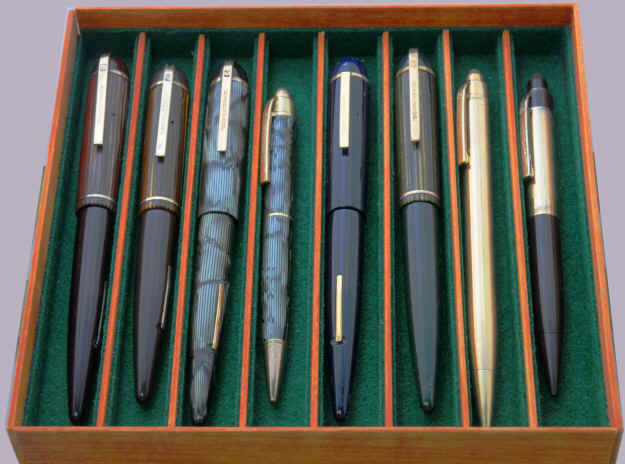 This is a demi sized set with black plastic barrel and derby and 14K gold filled caps with horizontal grooves. The pen has a medium width nib that has been ground by Pendleton Brown into a "Pendleton Point" Cursive Italic. This set is imprinted with the name of its original owner and came in a tiny Morocco leather case imprinted the same, R. GUMS.